Training can be time consuming and costly, but it’s also crucial to the success of your business. After all, your cleaners are the most important people on your customer service team! One of the biggest challenges with training is that it requires a huge investment of time from you / your management team, and while you can take steps to retain them, it’s not uncommon for cleaners to disappear in the first week or two of a new job. When Swept founders Matt Cooper and Mike Brown ran their own janitorial company they would start the training process before any cleaners were officially hired. More specifically, they would invite candidates who passed the phone interview to attend a group training session. It was clearly explained to cleaners that this was part of the hiring process and that they needed to attend to be considered for the job. Matt and Mike would then use a scorecard to keep track of how well candidates did during the group session. Did they arrive on time? Were they dressed appropriately? Were they engaged / asking questions? Before you begin planning out the content you’ll cover during staff training, do a Google (and YouTube) search of training materials that are available online. You can save yourself a lot of time and ensure you’re delivering a thorough training program by using materials that someone else has created that are a good fit for your company, staff and contracts. Disclaimer: we’re not suggesting you rely solely on generic, one-size-fits-all training videos for your training program! But before you start entirely from scratch, see what’s out there that you can reuse and combine with your own content to create a comprehensive program in less time. Whether you decide to create your training program from scratch or lean on pre-existing materials found online, it’s important to ensure your training covers not just the what to clean and the how to clean it, but the why we do things the way we do. This is important because if an employee doesn’t understand the importance of a task or procedure, they aren’t likely to make it a priority on the job. Take the time to talk about your reasoning for processes you’ve put in place. and 2) it allows you to proactively reach out to the customer, which means you are more likely to keep them as long-term, happy clients, and long-term, happy clients mean steady, predictable work for that cleaner. Even if it’s just in your head, by the time you’re ready to clean new trainers you’ll probably know what you need to cover in order for them to considered fully trained. But putting these topics / items / conversations on paper in the form of a checklist and providing your cleaners with a copy of that checklist when they start their training can help keep you both on track. Not only will cleaners feel like you are keeping them well-informed, they will see that you are taking training seriously, and take it more seriously themselves. Some companies even have cleaners sign off on their training checklist when they are done or have completed certain modules to indicate that they agree they have received intended training. A great piece of advice that we’ve stolen from Mike Campion at Grow My Cleaning Company is to use videos to tell stories throughout your training. Mike talks about how having employees act out examples of both the correct and incorrect way to do things is a great way to engage the cleaners and make the information stick. The skits can then be recorded and used as training videos for future cleaners. The key with videos however is to keep them short (we’re talking like 30 seconds,) so that the information is easily digestible and you hold the employees’ attention. Quizzes are a great way to identify when a cleaner might need additional training in a certain area. Keep quizzes short and the questions fair (no trick questions!,) to help your cleaners be successful when taking them. Your goal isn’t to make them feel like they are back in school, but rather to ensure you’re not sending them out in the field before they are ready. This is good for both you and them, so be sure to communicate it that way. 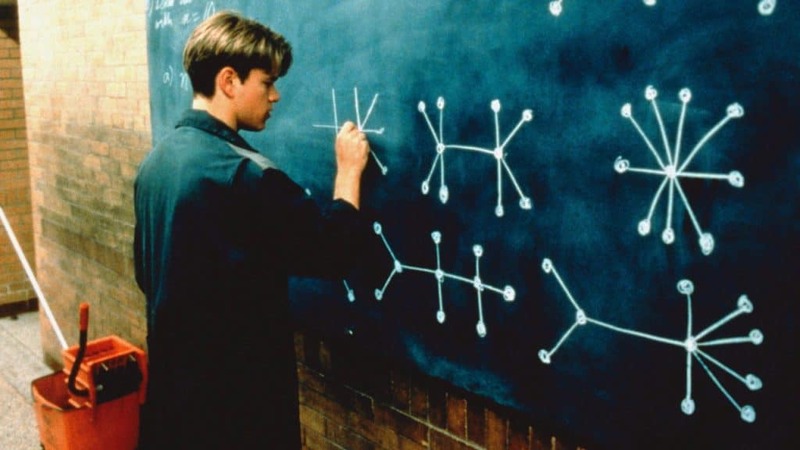 Some examples of online tools you can use to create quizzes online (for free!) 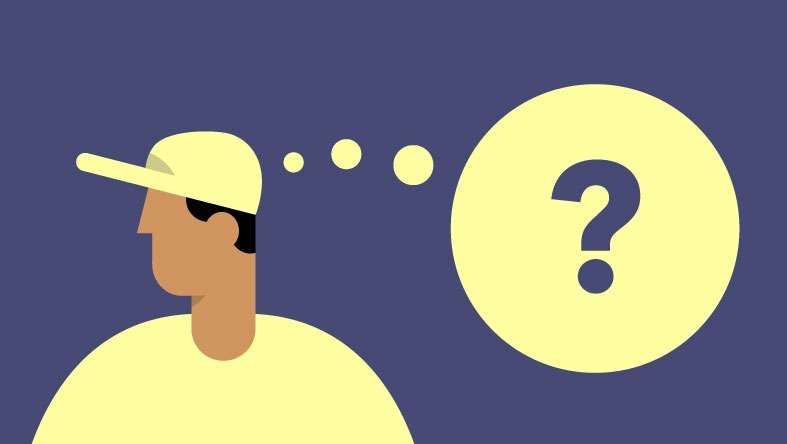 are SurveyMonkey and Typeform, but a quick Google search will give you many more options to choose from. Before you send a cleaner into the field on their own, be sure that at some point in your training process you have given them clear guidelines for measuring their own success. 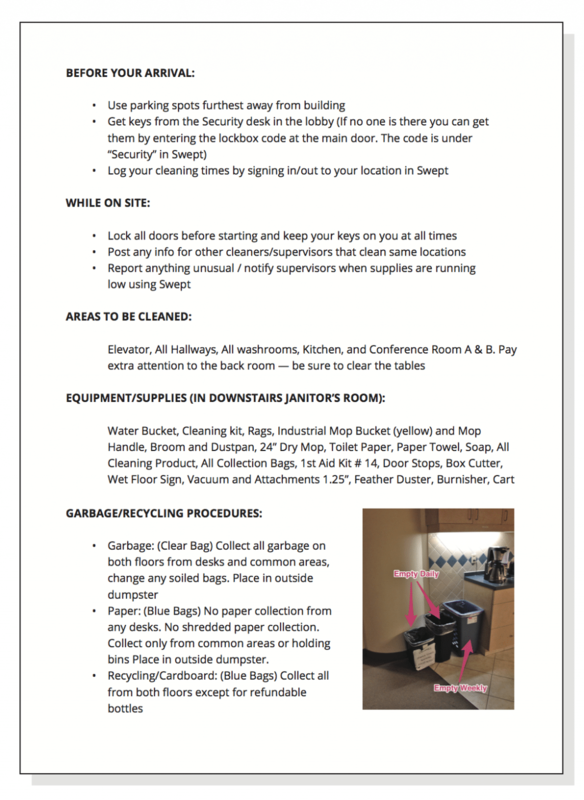 We recommend providing them with cleaning instructions for each location they clean (more on this in a minute,) but a copy of the checklist or scorecard you use for inspections could also be helpful. This is also a great time to describe any opportunities there are for movement within your company if they are consistently successful in their current role. You may be thinking, “Ain’t nobody got time for that!” but it’s not as difficult or time-consuming as you may think, and it is reeeally important to retaining cleaners. One of the main reasons cleaners (or anyone for that matter) leave their jobs is because they feel anonymous within the organization. To begin preventing this from day one, take the time to ask cleaners a bit about themselves during training. Where did they grow up? What are their hobbies or interests outside of work? What are their goals for the next few years? Be genuine and you will show them that you care about them as an individual — you’ll be much more likely to earn their respect, trust, and loyalty! 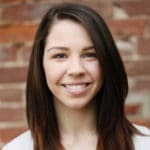 You may not be ready to create an employee handbook for your first few cleaners, but if your team is growing and you’re beginning to hear the same questions from cleaners all the time, consider writing down the answers and over time, putting together a document that covers FAQs and can be emailed to employees. To make sure employees will actually use the handbook, keep it short and sweet, and don’t print a hundred copies! The handbook should be a living document that gets updated as things change at your company, so keeping it as a digital file that can be emailed to members of your team rather than a hard copy that becomes outdated quickly. HR procedures like calling in sick, requesting time off, etc. Employee expectations, code of conduct, etc. 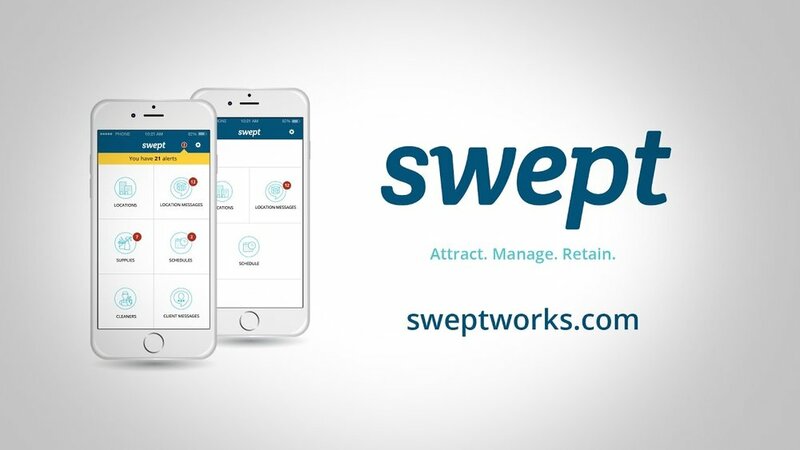 At Swept we firmly believe that just because a cleaner is trained doesn’t mean you shouldn’t continue to proactively support them and answer their questions on site. It’s not fair to expect cleaners to remember every little instruction you gave during cleaning for every building that they clean months later, so providing cleaning instructions to for each site that you service is crucial to their success. In the same way, situations will inevitably come up that weren’t covered in training. Provide cleaners clear instructions on what to do or who to contact when things don’t go according to plan and you will have fewer cleaners leave your company and more satisfied customers too. Click here to get a copy of the Problem Reporting Template we creating using a free tool called Airtable. 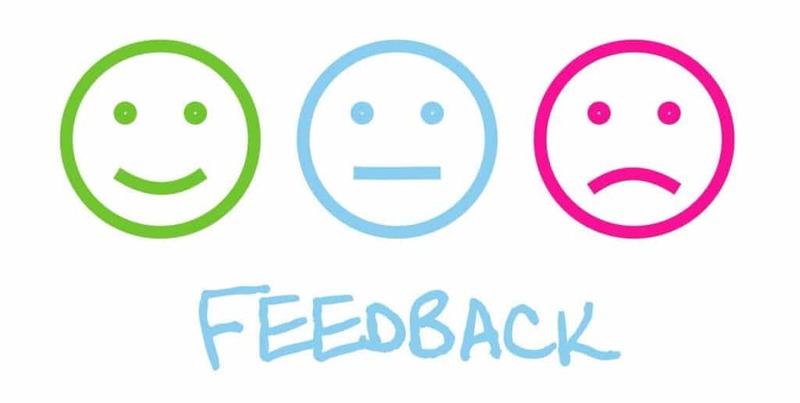 We also recommend checking in with cleaners throughout their entire time with your company, but of course you’ll want to start getting feedback on other areas of working for your company (not just training,) to find out where else you can improve and help them be successful. At the end of the day, the key to an effective training program (that doesn’t drain you of all your time and sanity,) is to make it a system. As you hold training sessions, take note of how long they take you. Are there areas you could save time by turning an individual training session into a recurring group session (ie. one that happens weekly or monthly for all new cleaners) or by having someone else (like an admin assistant or supervisor) handle a portion of the training? Remember that as a business owner your time is precious — and expensive. Every hour you spend on training is an hour that your business is paying for. Over time you should come to know how much your spending on training, which will also allow you to calculate what it costs you if you lose a cleaner once they’ve been trained (this will help you prioritize cleaner retention efforts down the road!) and how much time and resources you need to budget for training each month. 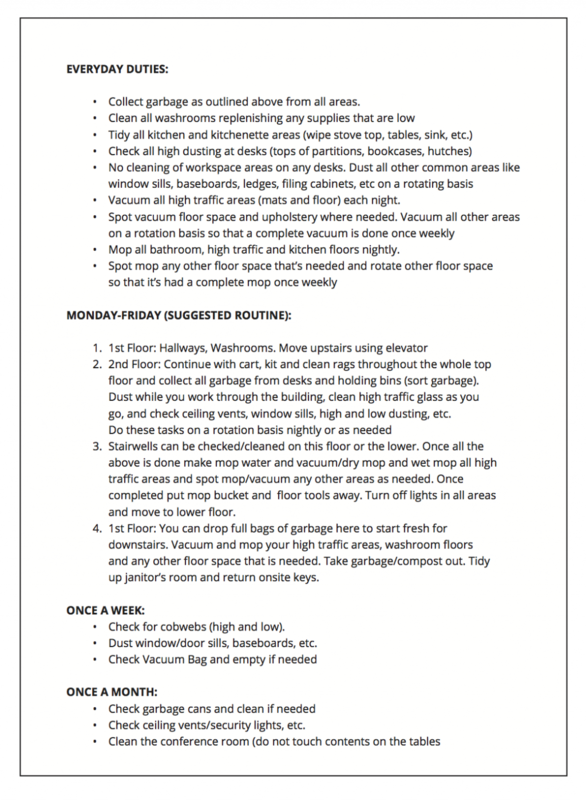 Not to be confused with the checklists you’ll provide to your cleaners during training (although they will look similar,) this checklist is designed to help you plan your training program. We’ve listed everything that generally goes into a comprehensive training program in hopes that it can provide you with a starting point for putting together your own training materials and modules.